In our second series of health-related corporate gifts the focus is on natural healing through accu pressures, aerobics and yoga products. Let us start with ACCU PADUKA or in other words slippers with pressure points to help you reduce various ailments. It reduces pain in lower & upper back, necks, shoulders, hips, muscles and joints apart from improving blood circulation. It strengthens the immune system thereby helping in preventing illness and excretion of toxic substances from the body. Paduka decreases muscular tensions, solves eyes problem effectively thereby improving health. Apart from improving digestion, sleep, concentrations etc. it also increases uptake of oxygen, energy levels and helps in developing positive mental outlook. Similarly, FOOT ROLLER comes with solution without drugs, allergy and side effects which is ideal for executives, professionals, office staffs, housewives, students, sports and aged persons. SINGLE ACCU ROLLER is effective for backache, neck pains, cramps, shoulder, calf muscle pains and sciatica. 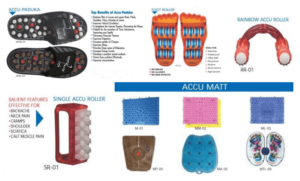 In accu series you also have choice of RAINBOW ACCU ROLLER and various ACCU MATTs. Please see the various images shown below for better understanding of the various health products. You have a choice of wide range of FOOT SOLE to ensure that you can protect your feet in the best possible manner against all kinds of ailments to live a healthy life. Please do write to us to understand the various uses to select the best for your feet. To help you find the perfect choice for your health we also have full range of NIGHT MASK with or without gel, EAR PLUGS and NECK PILLOW in different combinations to help you select the best possible solutions within your budget. Please select the best possible YOGA MATTs in 4mm, 6mm and 8mm thickness with or without covers to carry it around comfortably or to keep it safely in the car. NECK BELT helps in ensuring that you take care of your neck properly to bounce back to life as early as possible. FIGURE TWISTER is ideal aerobic fitness solution for the whole family to slim thighs, waist and hips back in shape while simultaneously improving your cardio vascular fitness. STEAM INHALER is effective in treatment of cold, bronchitis, sinusitis, stuffy head or nose and throat irritation. 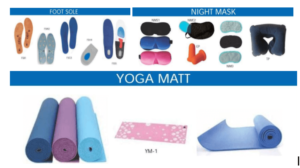 There are total three series on health related corporate gifts and you can refer to our earlier article focussed on cold and hot masks, ice bag, seat pads, travel packs and back support solutions. 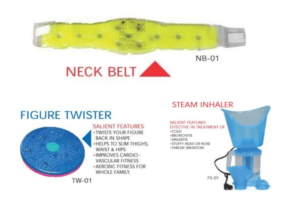 In the next and last article, we will be focussing on the various types of massagers namely body massager, multi massager, hair brush, wellness kit, back massage cushions including with infra heat and neck massage cushions for your target audience to meaningfully connect with your product or services as promotional merchandise.